Hello Sunshine bar is on the 6th floor at The Base Backpackers Queen Street. Known as Draft Comedy this has regular host MC Tony Lyall with a mixture of semi pros trying out new material and rookies trying their hand at comedy. This is currently every 2nd Tuesday. 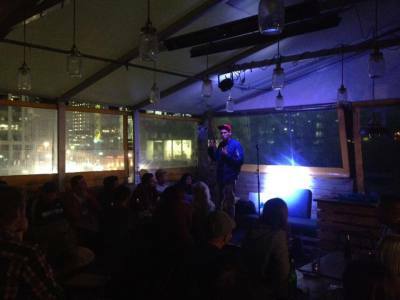 As with any open mic there will be a mixture of great jokes, good jokes with great potential, jokes that just missed and the occasion groaner. Often some very interesting interaction with the audience who are mainly tourists, some with little English. The bar is on an outside balcony though has awning and windbreaks. This does allow for smoking which can be a plus for those who smoke and may be an annoyance for those who don't. The drinks are cheap and there is some good cheap bar food available.